Soft chenille blanket by Angel Dear. 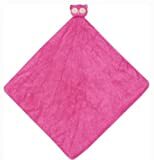 Cute and comfy blanket measures generously 29″ by 29″, will keep your babies cozy and secure during their naps.machine wash.
Angel Dear Napping Blankets measure a generous 29″x 29″. Soft characters to snuggle up with, machine-washabable and cashmere-soft. Super soft Baby Gear flower blanket. The background is a beautiful shade of light green.